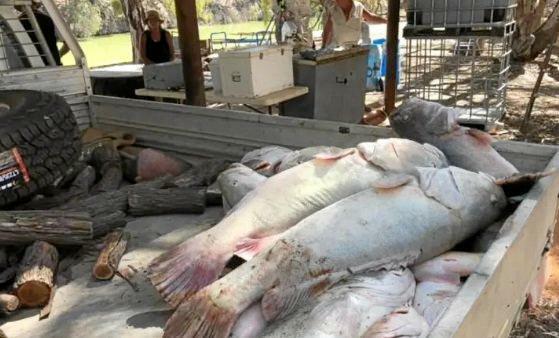 Giant Murray Cod killed when oxygen levels dropped dramatically in the Murray-Darling rivers system provide just another example of nature being taken to the tipping point through poor stewardship. IT should be the issue on all our minds but instead ahead of a looming federal election social media is filling with hate as the nation divides down sharp and disturbing lines. The tired cards of race and religion and law and order once again are being pulled from the bottom of political decks in safe knowledge the gullible will buy the bluff rather than really think through what sits in front of them. Fear is being stoked about paedophiles and Muslims. Lies and sneaky discredited claims regarding political character and behaviour are seeping into social media feeds where they find fertile ground to fester and distract among those more eager to have their prejudices reinforced than to properly consider how best their vote could be deployed. Century-old fish are dead in once magnificent inland waterways which for thousands of years received the summer flood waters from Australia's northern tip and carried them all through way through to the sea in the south. The fish rot in their hundreds of thousands, harsh evidence of an ecosystem that's hit its tipping point and testament to an era where money and influence have replaced common sense and careful stewardship. Yes, there has been a drought but what we are witnessing is something more than some seasonal outlier. We are seeing the consequence of taking nature for granted, of putting profit for a few ahead of any other consideration. It's happening everywhere across every endeavour be it land development or mineral extraction, education, health and aged and child care. The privatisation of core responsibilities of government doesn't work. Deregulation allows free rein to those whose only real objective is to line corporate or individual pockets free of accountability or concern for consequence. Where is the forensic analysis of point source pollutants that have contributed to this national disaster caused by a loss of oxygen through fertiliser-borne nutrient overload. And where next will poor practice lead to new tipping points being reached. How much will the future pay for our folly. The Great Barrier Reef, the Murray-Darling, Australia's once thriving koala populations and the biodiversity of our ecosystems have all paid a heavy price. Yet a bunch of wayward kids of Sudanese roots continue to draw disproportionate attention when the policy failures of government should be being dissected and those responsible for a national tragedy brought to account. Love it or leave they scream from the safety of their social media feeds, embracing neo-Nazis while rejecting considered science. How easy has it been made for fat, lazy chancers to mumble on about deficits and economic management all the while sprouting manipulated statistics about employment numbers and prosperity. Where is the party of the land in all this? Who's heard a squeak from Australia's greatest retail politician, the water minister caught in 2017 skiting in a pub about how he put the rights of irrigators ahead of proper stewardship of a national resource. "We have taken water, put it back into agriculture, so we could look after you and make sure we don't have the greenies running the show basically sending you out the back door, and that was a hard ask," Barnaby Joyce proclaimed. "A couple of nights ago on Four Corners, you know what that's all about? It's about them trying to take more water off you, trying to create a calamity. A calamity for which the solution is to take more water off you, shut more of your towns down." Well the calamity is now apparent for all to see. What you won't see is a National Party national farming policy that considers land use more carefully than just what profit can be extracted for corporate donors through the deployment of more chemicals regardless the impact elsewhere. And you won't hear demand for a return to properly-resourced public oversight of farming practices to measure the real unaccounted cost of mass agricultural production. What will be the next tipping point reached and how many will be reached before we put our prejudices aside and start facing realities. Will we continue to ignore mounting evidence of climate change until the seas begin engulfing our cities and coastal towns, and then caste around for anyone, anything other than our own complicity to blame. Australia may be a big country but its fragile, climatically more like the Sahara than some whimsical Utopia of milk and honey. This year's profit margin will mean nought to a future left to deal with our lack of focus and stewardship. And no amount of scapegoating of minorities will compensate for that.